Golden Thread gallery is delighted to announce the second in its annual Dissolving Histories exhibitions, this year under the name New Narratives. The series follows on from the acclaimed Collective Histories of Northern Irish Art, which was conceived to explore the unreliable nature of history. Our perception of the past can only be subjective: we are inextricably linked to our own experiences, values, memories and truths. It sought to appreciate the different versions of histories that combine through many voices – each instalment had a guest curator who specialised in a certain area of Northern Irish art history. While Dissolving Historiesrefers to this series, its purpose is different. Each instalment will investigate the notion of history itself. New Narratives is co-curated with Professor Paul Seawright, Executive Dean of Ulster University’s Faculty of Arts, Humanities and Social Sciences. The exhibition presents the work of four artists working across a range of media – photography, video, sculpture and installation. Pauline Rowan describes her photographic work as exploring sanctuary and the home, exploring our relationships with belonging and abandonment. Her most recent project, a selection of which is included in this show, was made in a deconsecrated convent and its abandoned gardens. The work features the building’s transient residents and remaining nuns, living their lives in the knowledge that their home will soon be demolished. Jan McCullough’s video piece, Vision Board Party, explores a ritualistic activity which aims to manifest desire into physical reality. 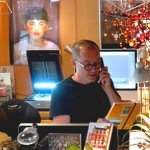 Participants, led by the vision board party’s facilitator, cut and paste photographic images and words from magazines to construct collages which express their future desires, both emotional and physical. These are then referred to and meditated upon in the belief that these aspirations will consequently become reality. Helena Hamilton considers and challenges the manners by which sound, vision and physical space determine our understanding of reality. Her work often incorporates repetition, through which she, in her words, “accentuates the themes of the everyday and simplicity, using them to construct atmospheres and immersive environments. 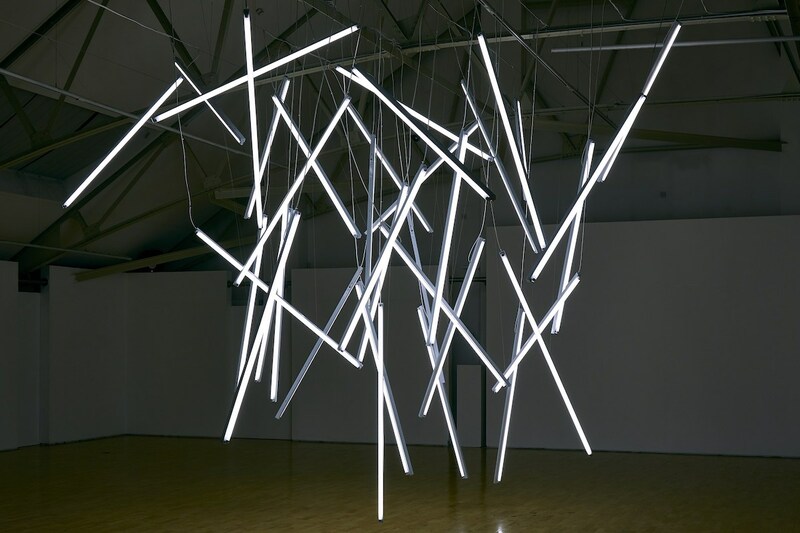 Included in this exhibition are two pieces, a large paper work which shows evidence of her physical presence and an interactive sculpture consisting of a number of suspended fluorescent tubes which respond to the audience as it moves. Gail Mahon’s piece, titled Controchasm, was made during a residency with Art Arcadia at Derry’s St Augustine’s old school house. The installation aims to evoke memories of past and present human activities and their ecological and social impact. The work was made by applying resin to the floor of the building which, when raised, created a skin with the characteristics of the old, worn floorboards which the artist has worked into with further materials. This brings to mind both the strength and fragility of the human body and thus questions our sense of identity as embodied in our physical forms. The exhibition, with its four very different approaches to making, considers our complex relationships with each other, both individually and socially. These complexities are presented from historical perspectives, looking at the diverse ways they change and are re-evaluated through time. Open till 9pm on the first Thursday of every month.